Is there anything video can’t do? It can surprise us, teach us, it makes us laugh even at work. Every day the world watches more and more video ads. And now with Google AdWords for video you too can put the power of video ads to work for you. This link will provide you with a PDF to download giving you step by step instructions. Whether you are a Novice or an advanced Power User of video ads. Netcommercial.net is the first step in that PDF. We write, assemble, deliver your video ads to your required specifications. Even if you don’t know where to start? No problem we’ve got you covered. It’s what we do. First things first you are going to need a video for your video ads. After you’ve secured that you will then place that video ad on your website. Most companies use an outlet like Youtube to host their video ads. No worry we will help you get that handled if need be. Once your video ads uploaded, you would then contact Google’s video ads marketing department to negotiate a campaign for your business and budget. At Netcommercial.Net we do not get paid by Google for this Blog information. We only create video ads, we are not a Search Engine Marketing company either. Leave that to the pro’s, to do what they do. By doing this, it will allow you to do whatever it is you do. Netcommercial only creates video ads, website commercials, social media ads, motion graphics, professionally. That’s it! Do yourself a favor and check out those links I have provided. There are statistics, facts, figures with solid marketing in regards to video ads. Interestingly Yahoo! reports that 22% of people / viewers find that pre-roll video ads are acceptable. A pre-roll video ad is an ad that plays before you see the content video the viewer was after. That is a large number of people considering the Millions of viewers there are. Even at 1% of 10 million is 100,000! Who feel your pre-roll video ad is acceptable. When you have Netcommercial professionally create your video ads, you have an option to allow Google to run a pre-roll ad on your video. Personally, I would not allow it for my company’s primary video ad or website commercial. Although, on the other hand if you were to create video ads that are extra or testimonials; those videos could have the ‘enable ad’ feature on them to create cash flow. Whereas the primary video ad is just that, a website commercial for your company. Then the ‘other’ video ads may be testimonial, or may delve further into your product or service those could have a pre-roll ad in front of them. Or if you do use Google for a video ads campaign you may need a 10 second spot to be a designated pre-roll video on another website. We can do that! 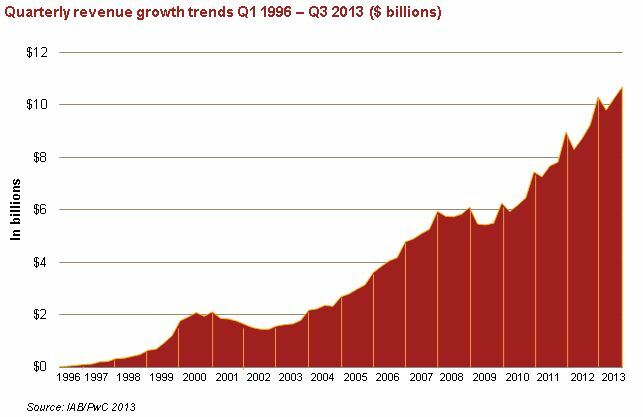 “Q3 2013 Internet Advertising Revenues Climb To Landmark High Of Nearly $10.7 Billion, Marking 15% Year-Over-Year Growth.” According To IAB And PWC. Local online advertising is still a very small piece of the overall market. Not to worry, Netcommercial exists and does indeed provide local advertisers the ability to effectively purchase local impressions. Your video ads are designed and created inexpensively and professionally; then delivered in any format requested. You need not be a large business to have that large business look. After all, you are competing with other businesses of your size. Do not worry about your location and Netcommercial’s. We are able to send you files over the Net and get everything handled remotely. Not a problem, we do it all the time. “Local online advertising is poised for an impressive growth in the next few years as local businesses get access to better technology.” Borrell Associates forecasts the local online advertising to grow from $13.7 billion to $16.1 billion! Be you a large or small business, video ads are your ticket to propelling your company above the competition. Remember, you are not competing with Coke, unless you are Pepsi. You are not competing with Home Depot unless you are OSH. You are competing against the other companies that are next to you on an internet search for your service or product. The more ‘click thru’s’ the better the ranking. The better ranking the better website placement is on a search engine. The better the placement; IGE: First page 3rd line, of a keyword search. The more consumers will check you out. At which point, a properly formatted, produced video ads will reassure your shopper they are dealing with a professional site. All while being entertained with your video ads, that not only demonstrates your products or services, but also can ‘sell the sizzle’ as well. Delivering your mission statement, brand, slogan or motto, within moments of a potential client accessing your website. In closing on this brief, yet informative ‘next step’ of your advertising marketing campaign. Again, those links I provided above are full of some great information for you to explore. I urge that you do so. They took a while for me to find as I scoured all kinds of websites and links, to bring you these facts, figures and some solid information in regards to this subject of video ads in one place. Although this is fresh in your mind at the moment, I also urge you to bookmark this page (Hit Ctrl “D”) to be able to return to it when you are ready to make an informed decision. If you do not, you may have a hard time finding all these links and info in one spot again. As always, to make a comment (which we love by the way) simply add the phrase Video Ads when doing so. This way I know you are a real comment and not the dreaded Spam bots.